Do you hear that? Tick tock tick tock tick tock tick tock … yep I believe that would be the sound of my biological clock ticking away. I’m sure everyone starts hearing the annoying clicking in their own time, although, I recently read that a woman’s biological clock starts ticking in her 20’s – jeez, that seems pretty early, don’t ya think? It probably starts when you’re in your 20’s, but it just gets progressively louder the older you get, kind of like the annoying alarm clock beep Beep BEEPING to get you out of bed in the morning or the annoying seat belt alarm in the car that persistently reminds you to buckle up for safety. I’d heard about this ticking time bomb theory, but I guess I never put much thought into it before because it didn’t apply to me. Now, at the age of 32, whether I want it to or not it definitely applies. But it doesn’t just tick tock, it tugs and pulls at you, at your emotions. It makes you question life as you know it. Lately it seems a lot of my friends and acquaintances (and by acquaintances I mean Angelina Jolie, Tori Spelling, Jennifer Garner, Gwen Stefani … because of my slight addiction to celebrity blogs I “believe” these people are my acquaintances and sadly, I probably know more about their lives than some of my siblings) are getting pregnant and having babies, and I’m thrilled for them of course – I love spoiling babies (not that I have the opportunity to spoil famous people’s babies, just the ones in the friends category)! But I’d been having this weird feeling, an undercurrent of sorts sweeping through my insides, that I couldn’t explain, and then I realized the annoying buzzing about inside of me was that infamous biological clock. 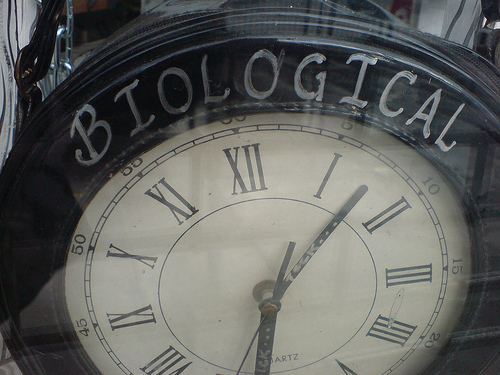 So why, all of a sudden, did the hands on my personal clock get so creaky and loud? Maybe it’s because I’m getting old and am in need of a lube job. Or maybe it’s been prompted by more than just my age. Part of the reason I hear the seconds ticking by so loudly could be because of all the baby news, but also, perhaps, because I am in the process of buying a house, the house I grew up in, which seems too big to live in alone forever. Foooooorrrrrrreeeeeevvvvvveeeeeeerrrr! I am spending time making this house a home of my own and what if it’s just an empty house? Just me and the cats. What if I don’t get to share it with anyone else? Suddenly, a house that always seemed so cramped seems awfully big and overwhelming. Sometimes I’m thrilled, ecstatic even, thinking about what I’ll do to the beautiful old house to make it mine. And then there’s the times when the more than 40 years of clutter overwhelms me to the point I feel like I’m drowning and I don’t know how I’ll make my way out from the huge waves of knick knacks and books and CD’s and dolls and dishes, to keep it somewhat presentable let alone make it my own. If I can’t conquer the clutter and care for a house, how on God’s green earth am I going to be able to start a family, care for them and the house all at the same time? I feel my heart palpitating just as I write about it. I would love to start a family. Mostly to carry on the traditions and the love that was so generously given to me. And how great would that be to do in the very house I became familiar with those traditions and unconditional love. But tick tock tick Tock Tick Tock TICK TOCK … will I be able to do it, to accomplish it all, before the seconds run out, and the hands on my clock become rusted and fall off? And who invented this whole biological clock, ticking time table? Can I just pray to God for an extension or pay an extra penance? The thing is, I really don’t want an extension. I want to have kids sooner rather than later. My sweet Mama had me when she was almost 45 and my Dad 50. I was the straw that broke the camel’s back, and while they should have been starting to enjoy their retirement years, they were taking me back and forth to college and shopping at bulk food stores for supplies to make sure I was eating well while I was away from home. Part of the problem is finding someone to commit to in order to even start a family. And it’s a catch 22 because the longer you spend out of a relationship the more tired you are of being alone and want to find someone to settle down and share the rest of your life with, but at the same time, the more you’re on your own the harder it is to fit someone into the life you’ve become accustomed to. So, if I can’t find THE ONE aka Mr. Right, I could adopt. Hmmm …. maybe a little girl from China. But then I’ll be a single parent with a HUGE HOUSE to take care of, all ALONE. Single. One person. Numero uno. I guess I have to have faith in that what is meant to be will be – “che sera, sera …”. Maybe I’ll meet the man of my dreams and start a family. Maybe I’ll start a family on my own and tackle being a single parent head on. Or maybe the house is my baby. After all, becoming a homeowner, while exciting, is also tiring and painful, which could be kinda like giving birth. And right now, as the tick tock keeps tick tocking away, I’d settle for a decent man who’s handy and can help me around the house. Tags: baby, biological clock, buying a house, children, first time home buyer, home owner, parents, single, tick tock. Bookmark the permalink. You said it all with the last sentence, “…i have to have faith…” with that faith your mother instilled in you to keep on keepin’ on, is where you’ll be able to find peace not in your heart but also in the house that you’re now making your home.